There has been so much good news about business embracing renewable energy that I almost didn’t give it a second thought when a Harvard Business School report called “America’s Unconventional Energy Opportunity” landed on my desk. Subtitled “A Win-Win Plan for the Economy, the Environment, and a Lower-Carbon, Cleaner-Energy Future,” I assumed it was a plan to transform our energy resources to renewables like wind and solar. States are pushing renewables too: New York State just released its roadmap for getting to 50% renewable power by 2030 by focusing on distributed generation and renewable resources. Their solution is to convert coal and oil based energy to natural gas and, when plants come to their natural end-of-life, we’ll replace natural gas with renewables. In the meantime, we’ll restore our economic supremacy by exporting cheap natural gas while reducing our own carbon emissions and energy costs. By 2060, we’d be generating zero carbon emissions from energy generation. It’s not an easy sell. The first problem is cost. To develop our natural gas resources will require $900 billion in infrastructure investment, including new interstate pipelines, storage facilities, rail, marine and road upgrades, gathering and processing infrastructure, and export terminals. In other words we’d have to spend even more to transition to natural gas as we will spend to convert to renewables, which the report estimates at $750 billion. In the end, with Porter’s plan, we’d be stuck with all that decaying infrastructure and fracking waste. Why not put that money into renewables infrastructure starting now? The report also calls for spending on training for higher paying jobs in natural gas. Again, why not spend money on renewable energy training instead of having to retrain workers later on? Porter’s argument is economic competitiveness — the GDP increases we would see if we push natural gas production. You can’t generate exports from wind or solar the way you can from natural gas, and ours is by far the cheapest in the world. 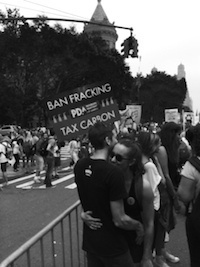 Many of the report’s recommendations read like a fossil fuel producers dream: in addition to some positive proposals such as imposing regulations and increasing transparency, it also advocates ending “outdated” restrictions on oil and gas exports and encouraging industry compliance with industry-led self-enforcement, even after some industry players have been seen to be systemically corrupt. All that said, the plan has several positives that should not be overlooked. First, shifting from coal to natural gas can take about a quarter of the responsibility for the 15% carbon reduction between 2005 and 2013. It may be the only certain path to achieving the EPA’s Clean Power Plan and eliminating coal plants. Producing just half the greenhouse gases (GHG) as coal (methane aside), natural gas is, as Porter et al say, “a crucial asset in making America’s energy transition both feasible and at a competitive cost across a range of carbon reduction scenarios, at least through 2030.” And that transition is way faster than fossil fuel industry thought leaders like Shell. As I discussed in a blog for CSRHub, Shell’s most recent future scenarios report advocates a transition to renewables by 2100. Porter’s assumes power grid alterations necessary for renewable energy will take 20-30 years, taking us to 2035-45, at which point renewables will be even more cost competitive than natural gas and will be completely phased out of power production before 2060. Working back from Shell’s prediction of 2100, that looks pretty good. We’re all tempted to point fingers at a policy recommendation that will delay achieving a zero emissions future while bolstering fossil fuel and power businesses. Isn’t this just business as usual? Maybe, but at least this timeline is much faster than the fossil fuel industry’s. Porter’s report acknowledges that if solar and wind prices continue to fall below oil and gas prices as they have in some places like Austin, Texas, business will drive an even faster transition. It’s all about the money, and in this case, that could be a very good thing. 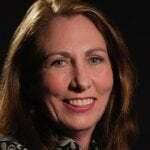 Carol Pierson Holding writes on environmental issues and social responsibility for policy and news publications, including the Carnegie Council’s Policy Innovations, Harvard Business Review, San Francisco Chronicle, India Time, The Huffington Post and many other web sites. Her articles on corporate social responsibility can be found on CSRHub.com, a website that provides sustainability ratings data on 15,000+ companies worldwide. Carol holds degrees from Smith College and Harvard University. The Seattle Times ran an article whose headline was so unsurprising I almost didn’t read on: “Oil industry not buying Gov. Jay Inslee’s cap-and-trade plan.” No surprise right? Big Oil’s actions tell us it not only wants to kill carbon pricing but still actively promotes climate-denial, a fact most recently reinforced by the cash-for-climate-denial scandal of Harvard-Smithsonian physicist Wei-Hock Soon, whose papers are the go-to reference for impugning climate change. Big Oil withdrew from direct supporting Soon and now funnels “donations” through Donors Trust charity, which in turn donates to climate denial organizations. And hadn’t I just been sent a link to Biggreenradicals.com, a site funded by the DC-based Environmental Policy Alliance (which goes by the ultra-cynical acronym “EPA”)? Its stated function is to “educate the public about the real agenda of well-funded environmental activist groups” and its investigations point to the Kremlin as a major funder of the US EPA. Russia funds the EPA to destabilize the U.S.? Really? Still, whatever “EPA” is spending on its whacky research is a pittance compared to $213 million the fossil fuel industry spent last year on lobbying and the $900 million a year given to organizational supporters of climate denial. Shell is not the only oil giant to endorse carbon pricing — BP also says it favors a global carbon price, and that national or regional carbon policies are “a good first step.” The industry knows it’s coming. 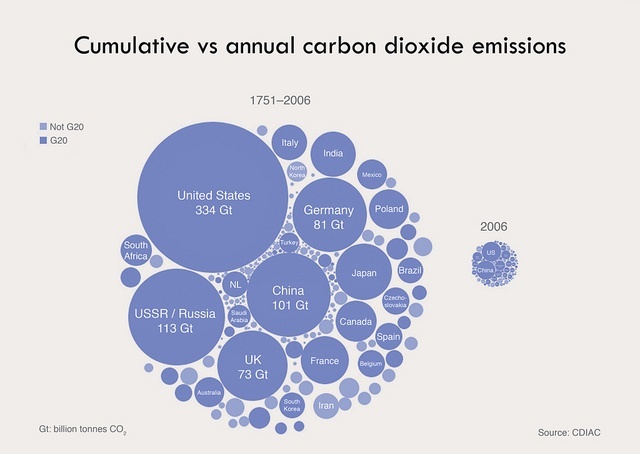 73 countries including China and Russia have or are creating a form of carbon pricing, either carbon tax or cap and trade. A successful cap and trade system has been operating since 2008 across nine states in the northeastern U.S. But here in Washington State, where the legislature is currently debating cap and trade legislation, the oil industry is opposing carbon pricing with everything it’s got. Big Oil CEOs say they support carbon pricing. Washington’s governor proposes legislation would set a price on carbon emissions. Big Oil refuses to negotiate. 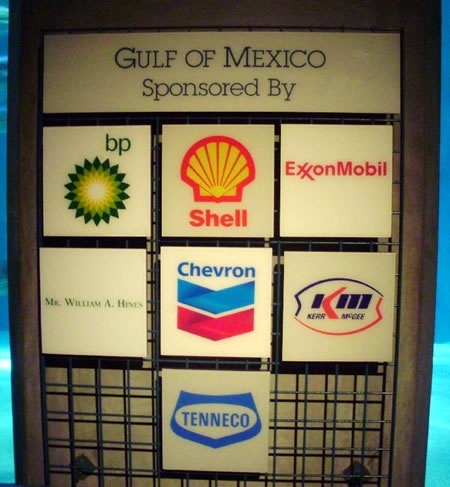 The oil and gas sector has spent $415,000 in donations directly to legislative candidates. Couldn’t they have stalemated without the expensive price tag? Last week, the GOP-controlled Senate passed a new $15-billion transportation plan that includes increases in the gas tax (nearly 12 cents phased in over three years) to pay for road infrastructure. …But the Senate bill also contains a so-called ‘poison pill’ that cuts transit funding if the governor imposes stricter emission standards on fuels, vehicles or fuel distributors, or limits carbon emissions. That would be true for the life of the plan, or about 16 years. How diabolically clever. Going flat out against any limit on emissions, much less cap and trade, would backfire in a pro-environment state like Washington, where 71% of the population supports the measure. With its Republican friends in the Senate, Big Oil devised a run-around that improves the odds that cap and trade will not become law and holds public transit ransom if anyone objects. 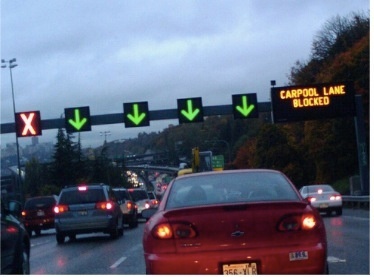 Improving Washington State’s roads could alleviate the terrible traffic jams in Western Washington’s cities. But they’d also make Washington State’s major polluters, private passenger cars, more attractive, and thereby assure that the switch from fossil fuels to renewables is extended. Carbon pricing seems inevitable, even to Big Oil, yet they’re using every trick to delay it, spending a bundle in this relatively tiny market to do so. Thankfully, we’ve got a governor willing to throw his political clout behind it, and the support of environmentalists, labor unions, health organizations, low-income groups and native tribes. And shouldn’t that be enough? If anyone needed more proof that economics trumps sustainability: low gas prices are causing a plunge in electric vehicle and hybrid sales. The same phenomenon is happening in the divestment movement. Moral outrage pushed 83 churches, universities and non-profits to divest $50 billion before the September climate march. This is a blip for an industry valued at $5 trillion, whose top investor Blackrock owns $146 billion in fossil fuel investments and where a single company Exxon Mobil is valued at $425 billion, and Shell and Chevron at $268 billion and $248 billion respectively. These numbers are staggering, and the pace of the divestment movement in relative monetary terms is glacial, despite its many moral and symbolic victories. Even if as Bloomberg’s New Energy Finance says this divestment movement has more rapid growth and quicker scaling than any of its predecessors, does it have a chance of affecting fossil fuel company behavior? Only when it starts to affect the stock price. And that’s only the beginning. Countries around the world are putting limits on carbon emissions, so much so that Governor of the Bank of England Mark Carney warned that "the vast majority of reserves are unburnable." The argument that fossil fuel companies’ reserves will become “stranded assets” has long been a hopeful prediction from activists, but the message has a different tone when it comes from a powerful central banker whose main concern is not sustainability but stability. Another concerned guardian of the status quo has similar fears. Bevis Longstreth, who served as commissioner of the SEC under Ronald Reagan and later chaired the Finance Committee of the Rockefeller Brothers Foundation, blasts the oil companies: "There is no good reason for this vast expenditure of stockholder wealth. It is wasted capital, an offense against stockholders in terms financial alone." Add to that the growing perception that the fossil fuel companies’ decisions about where to invest are considered irrational, and you've created a very serious threat to fossil fuel companies' stock price and the managers whose pay and bonuses depends on that price. And that’s the most likely route to real change. Carol Pierson Holding writes on environmental issues and social responsibility for policy and news publications, including the Carnegie Council’s Policy Innovations, Harvard Business Review, San Francisco Chronicle, India Time, The Huffington Post and many other web sites. Her articles on corporate social responsibility can be found on CSRHub.com, a website that provides sustainability ratings data on 13,000+ companies worldwide. Carol holds degrees from Smith College and Harvard University. CSRHub provides access to corporate social responsibility and sustainability ratings and information on 13,000+ companies from 135 industries in 127 countries. By aggregating and normalizing the information from 370 data sources, CSRHub has created a broad, consistent rating system and a searchable database that links millions of rating elements back to their source. Managers, researchers and activists use CSRHub to benchmark company performance, learn how stakeholders evaluate company CSR practices and seek ways to change the world. So it was a surprise to read the December 5 New York Times headline “Large Companies Prepared to Pay Price on Carbon.” Seemed a leap from what the real news was: according to the article, Carbon Disclosure Project, now CDP, released research findings that big companies have been figuring a carbon tax into their financial models for some time. The non-news “news” made the top right hand column of the New York Times front page, placement reserved for the day’s most important story. The same story seemed to appear everywhere at once, from Huffington Post’s Politics Section to Reuters and a week later, Forbes. Certainly, the media has recommitted to environmental coverage. New York Times Public Editor Margaret Sullivan ended her impassioned commitment to environmental reporting with a quote from Al Gore, “The survival of human civilization is at risk. The news media should be making this existential crisis the No. 1 topic they cover.” The heat is on. But my bet is that the news included, for the first time, the specific price per ton for carbon that each company is using. Exxon’s bet is $60; BP and Shell use $40; the lowest number is $6. CDP’s mission is to give investors data they can use to motivate companies to disclose their environmental impacts and take action to reduce them. It’s difficult for investors to make risk projections based on generalized corporate statements of intent. Much easier when the company publishes actual cost projections, as the respondents to CDP did. More than just another admission of responsibility, this is vital news for investors and confirms that CDP respondents are serious about carbon pricing. Or maybe CDP respondents finally took a hard look at what’s actually at stake. According to CDP, if oil and gas companies don’t come out for carbon pricing, the risk is delayed projects, further divestment pressure and, at the worst, threats to their license to operate. Stock prices won’t be hurt – in fact, investors like the certainty of carbon pricing. MarketWatch said of the announcement, “Big Oil is straying from conservative orthodoxy and making long-term financial plans under the assumption the government will force them to pay a price for carbon pollution as a way to control global warming — and Exxon Mobil Corp is better prepared than others to face the new expense” because of its investments in natural gas, which has lower measurable emissions. The potential opportunity from Big Oil embracing carbon pricing and accepting its responsibilities, as Exxon did in openly acknowledging to the New York Times that carbon pollution from fossil fuels contributes to climate change? A reputational turn-around that could result in higher stock prices. The most cynical explanation for the timing of the “news” is that that Big Oil is looking at carbon prices as a distraction from the real threat that fossil fuel production will be regulated out of business. They stimulated salacious delight in exposing their actual numbers and changed front page chatter from what had been dominant, that major public funding sources from the Ex-Im Bank to the World Bank would no longer lend to coal projects. When the administration nearly doubled its internal carbon price earlier this year, energy companies immediately jumped in – to demand the calculations be open to public comment. Carbon pricing wrangling could divert the media from more important stories. Photo courtesy of Carbon Visuals via Flickr CC.